‘The nature of a masterpiece is to remain eternally new; time glides by without leaving its mark on it’ (Estafette, 10 February 1879). 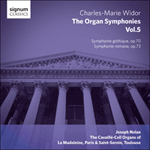 Distinct from the suite trajectory of Opp 13/42, the Symphonie romane—‘the apogee of [Widor’s] art’ (John R Near), completed in the summer of 1899 at the ancestral family home near Savigny west of Lyon—confines itself, like the Ninth, to a four-movement design. The opening phrases of a single chant—the Gradual Haec dies, quam fecit Dominus (‘This is the day the Lord hath made’, Easter Sunday Mass)—pervades the work, turning it simultaneously into a vast set of variations and a comprehensive application of Lisztian/ Franckian thematic metamorphosis. To Widor this melody and its ‘elegant arabesques’ was like ‘a vocalise as elusive as bird song’—lending itself to be used either flexibly, repetitiously, without development (as in the opening moderato); or metronomically. ‘When this theme is caught in a symphonic web, becoming part of the polyphony, it must be executed strictly in tempo, calmly and grandly without any kind of attenuation. It is not free any more, but has become the property of the composer.’ Motioned into being by ‘an introductory arabesque, as evanescent as a whiff of incense’ (Near), the first movement (12/8) initially presents the chant, quasi recitativo, espressivo, a piacere, against an F sharp pedal-point, the first four notes of the melody, F sharp-E-G-F sharp, delineating a familiar B-A C-H contour. The second and third voluntary-type movements are tripartite—a smoky adagio Chorale in F major (4/4), harmonising homophonic poco agitato in G major. Tonally discursive and temporally varied, the D major allegro finale, subdivided into five chapters, belongs among Widor’s supreme achievements, an imposing, richly stratified paraphrase on Haec dies in compound and simple metres, the power of the instrument setting acoustic and soul into a gloire of resounding union and oceanic inexorability—before the ‘incense’ of the first movement and five bars of triadic blessing, pianissimo, return it to silence. The Tenth is the only one of the cycle for which an autograph survives, albeit incomplete (Bibliothèque nationale). Widor gave the earliest referenced performance on 6 January 1900, at the then new Kaiser Wilhelm Gedächtnis Kirche in Berlin, his recital including also Bach’s G minor Fantasy and Fugue, ‘played marvellously’.